These items are currently only available in the United States. The Grand Repos wing chair by Antonio Citterio offers exceptional comfort, particularly when paired with the Ottoman. The synchronized mechanism concealed beneath the upholstery supports the user at every angle of inclination and can be locked in any position. Once the user is comfortably reclined, the Ottoman provides a soft footrest for ultimate relaxation. Materials: Chair/body: Molded polyurethane foam with webbed plastic frame and integrated synchronized mechanism with locking device. 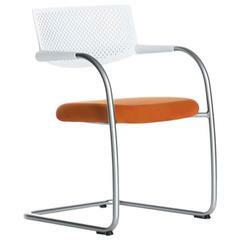 Base: Four-star base in die-cast aluminum, polished or powder-coated finish. Neck pillow: Filled with feathers. Ottoman: Plastic panel, polyurethane foam and polyester fiber. Four-star base: Die-cast aluminum, polished or powder-coated finish. Glides: Fitted with plastic glides for soft floors or felt glides for hard floors. Chair dimensions: Width 74 cm. depth 81 cm. height 115 cm. Seat height 41 cm (16 in). Ottoman dimensions: Width 62 cm. height 45 cm. 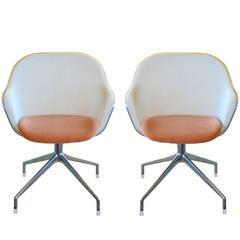 Leather Premium(L40)93/seat height01/height ottoman01/base03/glides04. Creating innovative products and concepts with great designers is Vitra’s essence. They are developed in Switzerland and installed worldwide by architects, companies and private users to build inspirational spaces for living, working and shopping as well as public areas. With its classics Vitra represents groundbreaking 20th century design. Today, in combining technical and conceptual expertise with the creativity of contemporary designers, Vitra seeks to continue pushing the boundaries of the design discipline. A family business for eighty years, Vitra believes in lasting relationships with customers, employees and designers, durable products, sustainable growth and the power of good design. The Vitra Campus with buildings by some of the world’s leading architects and the Vitra Design Museum with its exhibitions on design and architecture, design archives and a comprehensive furniture collection are all part of Vitra. They inspire visitors, inform the design process and create an atmosphere in which innovation flourishes. 1990s Antonio Citterio ‘Area’ sofa for Vitra. Good condition consistent with age and use, Minor wear marks, scratches in the leather see photo. 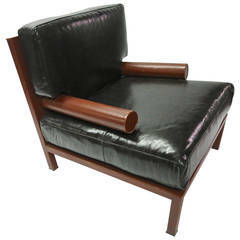 Leather chair with dark brown oversized cushions in brown leather. The round arms rectangular back and seat all in red leather. 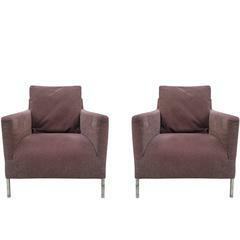 Designed in 1987 by Antonio Citterio for B&B Italia.